For those that are not familiar with the term, "storage cluster" is a storage solution of at least two servers. A storage server is a type of server that is used to store, manage and move various files and data over a shared network. Generally speaking, storage nodes are the individual servers that make up a cluster. While this configuration is ideal for larger sized productions, the typical 96TB capacity of the smallest three-node cluster was often far beyond the requirements and financial means of smaller facilities and media shops. Small to mid-size facilities are beginning to tackle high data rate projects in HD and Ultra HD and often do so using a single-write, multi-read limited storage infrastructure that really isn't up to the task. On a single-write system, the larger file size significantly bogs down the storage bandwidth and performance. The introduction of a single-node configuration at NAB 2017 allows facilities to manage these media intensive projects with much greater efficiency in terms - bandwidth, scalability, reliability - in the "right-sized" infrastructure configuration. The native client, multi-threaded driver with low overhead and latency provides Windows, OS X and LINUX workstations with the performance they need for Ultra HD projects with the ability to easily expand to address future media storage needs or as their existing old storage is phased out. In a nutshell, this new single-node shared storage platform will enable small and emerging studios to migrate their workflow into a modern scale-out environment that can grow as their business expands. Single-node systems make this expansion very straightforward. Simply add one or more new storage nodes to expand capacity and bandwidth. The approach allows facilities to step in at a price point and platform configuration that is best suited for the stage of their production and, more importantly, their budget. In addition to the expansion and customization, the single-node system offers a straightforward administration setup, making it much easier for facilities, especially ones without dedicated IT engineers, to administer the storage. Regardless of the size, the single-node systems always present as a single namespace (or single file system), eliminating the need to balance project workloads on multiple raids, luns, volumes or file systems - an onerous task that is common with legacy SAN and NAS storage setups. And, unlike many SAN storage solutions, the performance of the single-node file system doesn't decrease as storage use increases. It remains constant throughout the production. Its standard l 10GbE network ports and file system Native Client driver for Windows, Mac OS and Linux, which replace legacy SMB and AFP network protocols, deliver a much higher and consistent performance boost every time. Distributed, parallel files systems, like the EditShare File System (EFS), enable these powerful features in storage clusters. Optimized for maximum efficiency, each single-node EFS system that ships comes equipped with Flow media asset management and Ark media archive applications. Flow allows users to find and track all their valuable assets within the organisation, saving hundreds of man hours spent trawling through drives trying to find that elusive right clip. Ark secures the long term viability of those valuable assets with its simplified and powerful archiving system. The integration of Flow and Ark within the EFS shared storage environment provides a robust foundation that can be customized to aptly support today's modern end-to-end workflows. So, a facility can really augment the system to meet its current media demands whilst allowing the ability for the facility to grow when their needs do, adding high availability metadata servers, design workflow automation, and integrate QC. They can configure workflows to manage and automate movement/transcoding of valuable content from the time it arrives into the facility to when it's archived and utilized again. The extensibility and adaptability of these systems and surrounding workflows is near endless. But key for every production out there regardless of their size is reliability. This is where the EFS architecture shines. The hardware-based RAID 6, which protects against as many as two drive failures in each chassis, and redundant hot-swap power supplies, boot drives and fans ensure that single-node EFS systems support around-the-clock, mission-critical production operations. Today, EditShare is offering two XStream EFS single-node models - XStream EFS 200 and XStream EFS 300, with the configuration information for each below. And for those facilities that need a bit more under the hood, check out EditShare's XStream EFS 450 multi-cluster model, the flagship system that born the line - http://www.editshare.com/products/xstream-efs-450. The XStream EFS 200 is a single-node configuration with 12 enterprise-grade HDDs offering 24, 48, 64, 96 or 128 TB of raw storage capacity in a 2U space saving form factor. The XStream EFS 200 is "EFS Native Client" compatible. Client workstations connect via a lightning-fast, multi-threaded client to achieve a performance boost of 20% or more compared to legacy SMB and AFP network protocols. In addition to media management capabilities like advanced project sharing, the XStream EFS 200 ships with five Flow production asset management licenses and an Ark archiving application. For a full description of the XStream EFS 200 model, please visit http://www.editshare.com/products/xstream-efs-200. For customers who need greater capacity and lower cost per TB (usable) than is available with XStream EFS 200, they can step into the XStream EFS 300. 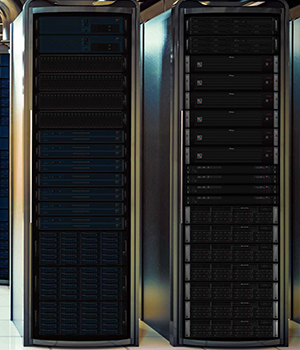 Equipped with 16 drives, the XStream EFS provides 28, 56, 84, 112 or 140 TB of usable capacity in a 3U chassis. Along with increased capacity, the EFS 300 has additional processor power delivering increased bandwidth capability and stream counts. Like the EFS 200 series, the EFS 300 is "EFS Native Client" compatible and benefits from a performance boost of 20% or more compared to legacy SMB and AFP network protocols. In addition to media management capabilities such as advanced project sharing, the XStream EFS 300 ships with 10 Flow production asset management licenses and an Ark archiving application. For a full description of the XStream EFS 300 model, please visit http://www.editshare.com/products/xstream-efs-300.